I was going through some of my old images and came across these from two years ago. The shoot was for a Home Depot design challenge. It's amazing to me how much the kiddos have aged in such a sort amount of time. Well for that matter I can't believe how much I've aged either. Ha. Oh, how I miss my garden and am grateful to our renters who have kept it going. Some funny tidbits on behind the scenes of a styled shoot... It was so HOT that day, like miserably hot. You have to shoot a few months in advance so we were still in the midst of a Alabama heat wave. The sweater I am wearing was on a friend a few hours before. I liked how it was fallish, but I wouldn't die in it so she took it off and handed it over. My friends all thought it was hilarious that I was carrying a baguette for they know my gluten allergy would mean in no way it would make it to my table in real life. It does make for a pretty picture though. The soup was served cold. Who really wants soup in 100 degree weather? That pretty curl I'm sporting was actually a rat nest from wearing my hair in a bun so much. All in all though the "party" was a hit with the kiddos and we all had a blast doing it. 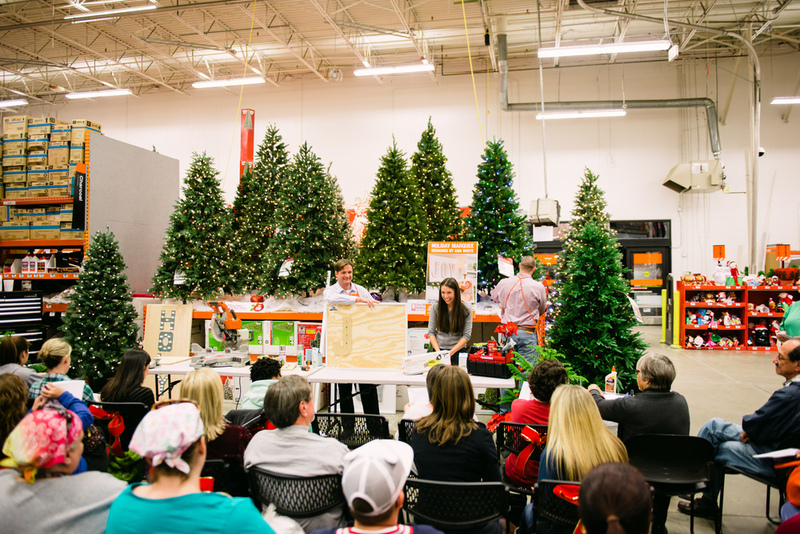 On Thursday night I had the pleasure of hosting a DIY workshop with Home Depot. I so grateful to all those who attended. Like really grateful. It was a fun experience and the project was oh so fabulous. I made a version for myself that just may stay up year round. Here is the link to the project. I think they said it would up till around Christmas. Obviously I did mine a tad differently. Mine was bigger and I used a higher grade plywood, used larger plug in lights and painted my letters on. The idea was still the same though. I think my total was just under $35/$40 and for a 2ft by 4ft piece that's not too shabby. Plus I used the fancy eco friendly led lights. I was happy to be asked to be a sponsored blog partner with Home Depot for an upcoming DIY workshop! We will be learning to make this Holiday marquee sign. Is this not fabulous! I would leave it up year round. The workshop will be held at my local Hoover, AL Home Depot store on November 20th from 6:30 to 8:00pm. We will be learning the skills needed to create this lighted project including using power tools and such. WHOOP, WHOOP! Oh, and I may even be hosting some giveaways that evening too. It will be a fun girls night out and I would be more than thrilled if you joined me! Not a local? Maybe one of these other blogger hosted events will be in your area!